SUMMARY: The marketers at fitness app RunKeeper needed to find a simpler process for utilizing the data they had available to properly segment RunKeeper's 40 million global users. Learn how the team was able to improve deliverability and send content to the right people at the right time through a segmentation effort that doubled the open rate for a send from the previous year. Fitness tracking app RunKeeper was launched in 2008, and since then, it has been helping people track running paths using their phones' GPS. "You can easily just hit start when you're going out for a run, and you'll get audio cues that tell you your pace and distance and how far you've gone and that sort of thing. And then you hit stop, and it saves the activity, and it sort of creates a history of all the activities you've recorded with us," Erin Glabets, Director of Marketing, RunKeeper, said. Glabets oversees the marketing team, which covers all communication with users, ranging from email to the blog and social media. The RunKeeper team had been specifically focusing on email over the past few months as the app has continued to grow. The team had approached email in a few different ways, with triggered emails for actions, such as completing an activity or receiving a friend request. The team also utilized pushed emails for announcements and pitches for upgrading to RunKeeper Elite, the company's premium product. "Then also, we've been working with brand partners who pay us to run campaigns for them, advertising new product launches and that sort of thing. And usually, it's tied to the user's activity and running a certain distance and being eligible for a discount or a potential to win a product," Glabets said. A challenge for the team of three is their huge user base of around 40 million people over the app's history. They wanted to rely more on email to maintain communications with these users. "With the different types of campaigns, there's a lot of targeting we wanted to do. Obviously, if we're trying to reach people for a brand, we want it to be people who were most recently active in the app," she said. RunKeeper's existing email platform was static in that it pulled in the list, Glabets explained. There were parameters to customize sends around, but "if we wanted to do anything really custom or using our data, we'd have to have our data team create a separate query and create a whole new list, and then we'd upload it, which is just very taxing." It was also difficult to see which users were still active and even how many bad or incorrect email addresses were on the list. The RunKeeper team was looking for a way to take advantage of all of the data they had available around user behavior through email, "and do it really fast, without as much engineering or technical resource needed each time," she said. In order to accomplish this, the team switched to a new email service provider that could accommodate their goals. RunKeeper orchestrates "Challenge" campaigns to encourage people to set new goals and continue using the app. "We just did one for January that's tied to a video. So we did a video featuring a few RunKeeper users, encouraging people to get out there and set goals for the New Year," Glabets said. With this campaign, the team wanted to capture people who had been active — or had even lapsed in the past few months — and "would be encouraged by video content like this," she added. Because the New Year is such a big time for fitness goals, every time someone finished a run, they would get an email with a discount to the premium product, encouraging them to purchase. RunKeeper had never created a campaign with such a high level of segmentation, because, according to Glabets, "[we're] still trying to make sure deliverability is strong and IP addresses are happy," Glabets said. With the old ESP, the team had trouble seeing which users were still active and even how many bad or incorrect email addresses were in the database. With the new system, the first thing the team did was segment out those who had opened emails in the past, and from there, "we could play around with parameters on who had used the app more recently," she said. Because the app is used by people in different time zones, it was important to segment by area. "Using the different time zone sends really helped us … to spread out who was receiving the message when and making sure that it was getting to them at a good time in their current local time zone," she said. Additionally, RunKeeper has 13 languages available in the app, and 70% of its 30 million users are outside of the U.S. The team had the email translated, which required the email to be segmented by language as well. The team has used video in their sends before, but "this time, it's just being able to segment out a little more intelligently and also play with the languages and the translations and the time zones," she said. With regards to deliverability, "just looking at the open rates before, when we were just doing sort of these big bulk sends with no segmentation versus the open rates now, where it's clear that we're emailing things to people who actually want to receive them and are therefore opening them and acting on them. That is a big improvement," she said. 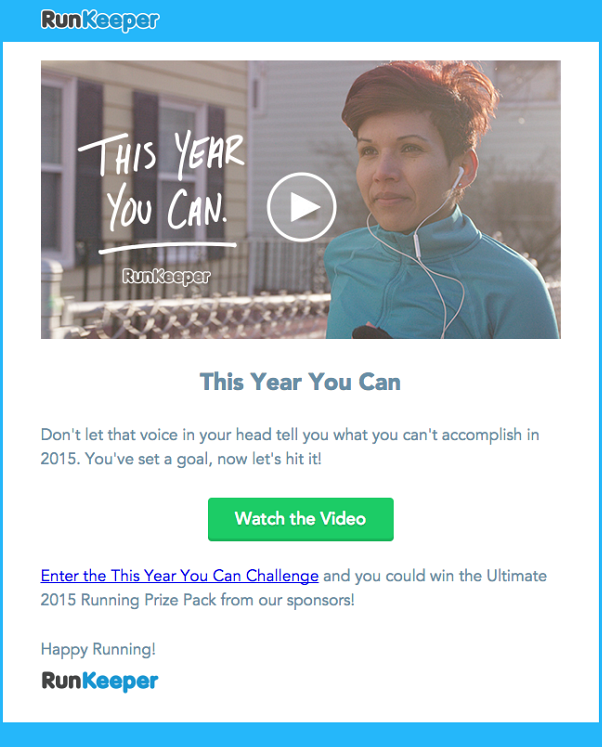 RunKeeper has a data team the marketing team worked with closely on their email segmentation. A key part of that relationship was discussing campaign goals. "[We] talked to them, and really, for one, just asking questions for the goals of this campaign, [which] were to get people to see this video and then engage in the Challenge we were running, to be active around it for the rest of the month," Glabets said. With the goal of encouraging activity around the New Year's Challenge in mind, Marketing continued to work with the data team to send the email out to 7 million users, pushing them to watch the video that had been created for the campaign. "From there, [we] worked with data to think about who … in our system was definitely going to open it. Who had been at least active enough with the app that we think they had the potential to reactivate if they had been lapsed," she said. Because of the time zone segmentation, the team worked to send this one-time Challenge announcement to users over the course of two days. "We wanted to break it up to make sure deliverability was strong, [so] we did it over the course of a couple days … Based on that language and that sort of thing, we treated it as a couple of different sends," she said. With each campaign that the team sent out, they looked at the resulting metrics and "decide if there are certain pieces of data we should dig deeper into next time to make the send even smarter. But I think it's just a constant learning experience on how to do that," she said. 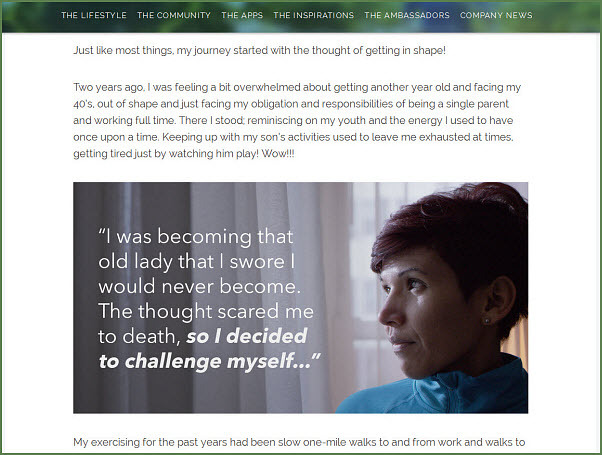 The email focused on a video that highlighted the fitness journey of three RunKeeper users. "[The video] just showed what they were working on with their fitness challenges. We showed one overcoming an injury, another just overcoming being busy and that sort of thing. And then the challenge was just encouraging everyone to just get out there themselves," Glabets said. The send went out on January 15 and asked people to complete a total of three hours of activity in the app by January 31. The email copy reads, "This year you can. Don't let that voice in your head tell you what you can't accomplish in 2015. You've set a goal, now let's hit it!" "The idea is, we have a … much more beginner and broader set of people with the RunKeeper app, rather than high-performance or competitive runners. So we just wanted to present a message to encourage people to just start now … It's not about how fast you're going or how many miles," Glabets said. The team also put the New Year's Challenge videos up on Vimeo and set up a dedicated landing page on the RunKeeper website. Each user's story was also the focal point in a dedicated post on the company's blog. Next, Glabets said, the team will be trying to send out a monthly newsletter that pulls in content from the RunKeeper blog to drive more traffic to the blog. Segmenting is incredibly important to their app, Glabets said. Easily being able to segment has made a tremendous difference. "Previously, we wanted to use our data to get smarter about sends, and it was just a lot more work because we were using a much more static system. So the one we use now just plugs into our current database, so any time anything changes on the user side, on the database side, [our current vendor] can easily capture that," she said. From this campaign, RunKeeper was able to see a 100% increase in open rate, compared to another Challenge campaign from the same time the previous year. "Because we were able to target who we emailed better, this meant we could send about half as many emails and get roughly the same amount of overall opens compared to the previous campaigns, which means we essentially cut our costs in half," Glabets explained. The team also saw a similar clickthrough rate to the previous campaign alongside a 1.5% improvement in deliverability, thanks to segmentation and only sending to active users. "The importance of that real-time interaction between your actual database and your email system … that's just super important. And [so are] the endless ways that you can fine-tune and optimize campaigns around segmenting," she said, adding that there is a lot more the team will be doing over time to customize to the RunKeeper audience. Marketing Research Chart: Do different age groups prefer different channels?